“I always knew that I would be here one day,” Tawada English affirms. The stylish and sophisticated grandmother says she’s always had a plan. She even wrote down a list of the things she wanted to do. But life seemed to get in her way. English was pregnant when she left high school at age 17. Her daughter, Chalatia Hayes, was born prematurely and struggled with poor health in her early life. English had to care for her daughter and pay the bills, so she found a job in home health care. As the job turned into a career, English discovered that compassionate care was her forte. However, something was still missing. It was after the birth of her second grandchild, Jaden, that English made up her mind to begin working on those goals. She also has one other daughter, Javenna, and another grandson, Telawn, 9. 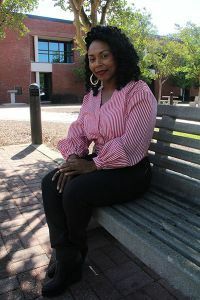 She credits her instructors and the staff at Pensacola State with helping her navigate a system that was foreign to her. Going back to school at almost 40 was overwhelming, but English said she was determined to do whatever she needed to make it happen. It took her six months to obtain her GED diploma in 2013 through Pensacola State’s Collegiate High program, then she started college classes in health care management. English funded her education with financial aid and scholarships. “I used all my talents, Honey, for this education. Yes I did ─ singing in the jazz choir was one of them,” she said of being awarded a Pensacola State choral scholarship. She also considered herself a mom to her young cohorts in the choir, as well as to several classmates who were on the basketball team. English may have unrelenting momentum, but she’s accomplished her goals with a savvy that mimics her impeccable style. She received a Scholastic Achievement Award at the Student Excellence Awards Ceremony on April 10. She was inducted into Sigma Beta Delta scholastic honor society on April 23. English also earned a place on the Pensacola State President’s List for Baccalaureate Programs in 2017 and 2018. On Sunday, May 6, English graduated with honors with her bachelor’s degree in Health Care Management and plans to start graduate school in December at the University of South Alabama or Liberty University. She intends to pursue a master’s degree in Health Administration and would like to obtain a second master’s degree in theology. But that still won’t be the end of the list for Tawada English. “My long term goal is the Ph.D. … oh, and I’m working on my book,” English mentioned offhandedly. She hopes to write a book that chronicles her journey and inspires others.